August 10 – August 16: 8 Weeks 0 Days – 8 Weeks 6 Days. 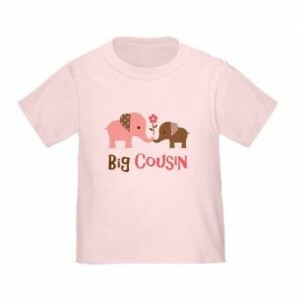 We announced my pregnancy to my family with this big cousin shirt for my niece, Rosie. Richard and I spent three days last week driving from San Francisco to Vancouver. I knew my mom would have dinner on the table as soon as we got to Vancouver, and I wanted to share the news of our pregnancy first thing so that any nausea-induced rudeness (like pushing the brussels sprouts as far away from myself as possible) would be interpreted in context. We sat down for dinner with my parents, my sister and her husband, and my two-year-old niece, Rosie. Before we could even say grace, I produced a green tissue-paper-wrapped gift and said, “We got something for Rosie. Let her open it right away!” Rosie unwrapped the package and held up a pink shirt. My sister read aloud the words printed below two amicable elephants: “Big Cousin” (A reformulating of my initial plan to tell Richard I was pregnant the week I found out). Everyone was pleasantly surprised and congratulated us. My mom got up to give Richard and me a hug and cried happy tears. Normally I would be the one to play with Rosie while Richard helped out with cleaning up from dinner, but this trip I spent a lot of time laying on the couch and “Auntie Riri” (what Rosie calls Richard—she hasn’t quite figured out the difference between aunts and uncles yet) got to interact with Rosie a little more. Nothing is as reassuring to a pregnant woman as watching her partner successfully care for a child. He said that having his own baby on the way gave him a new confidence with children—or at least motivation to start practicing. I saw several friends while I was in Vancouver, some of whom guessed I was pregnant before I could break the news! Normally with my friends and family I go on a hike, or kayaking, or skiing. I was grateful that my loved ones were willing to go on gentle walks or do other activities that I could bring a folding chair to. I’ve heard that—contact sports aside—expecting mothers can continue doing most of the activities they did before pregnancy. It must be true for some women, because I’ve seen pregnant ladies running and women in my vinyasa yoga classes up until their last month of pregnancy. That’s not the case for me. While gentle physical activity makes me feel better than sitting around resting all day, my body seems resolutely against anything strenuous. Activities that push my cardio, strength, or endurance make me feel nauseated. Even deep stretching doesn’t feel good. My pregnant body is a Buddhist, urging me to embrace moderation—the middle way. At least because of the meditation I can take a step back from my outbursts to laugh at my gracelessness and accept that I am a human on a journey. Perspective: As I publish this at during my twenty-second week of pregnancy, I can’t help but laugh reading back over this journal entry. One evening this week, I asked Richard if he could cut up a mango for me and get me a glass of water. As he obliged, he said “I think you’re finally getting the hang of to letting me do things for you.” I felt equally proud and chagrined. I think he could sense my cognitive dissonance, because he added, “That’s a good thing!” Hopefully by the time my baby’s birthday arrives I’ll have enough practice to be able to completely and shamelessly surrender my need for control. After all, as Richard often tells me when I’m combatively independent, “You know, eventually you’ll have to leave our children alone with me for a few hours, and just trust me to take care of them.” I would never want my type-A personality, control-freak mentality, lone wolf tendencies to cost him trust, respect, and precious one-on-one time with his children. As I wrote fourteen weeks ago, I am still a human on a journey. Om Mani Padme Hum is one of my favorite mantras. Translated directly, it means something like: the jewel is in the lotus flower. One of my teachers explained this metaphor to me: if we peel away the layers of our identity (much as one might peel away the many petals of a lotus flower), we reveal our true nature (the jewel inside). If we let go of the transient labels we by which define ourselves (and they’re all transient), we uncover our inner light. We can find moksha, freedom. We can begin to peel away these layers in meditation by questioning the pieces of our identity: Who would I be if I lost my job title? Who would I be if I lost a leg? Who would I be on mood-altering drugs? Who would I be if went through gender reassignment surgery? You may find that even after you’ve whittled down to the bare bones of your identity, there’s still a conscious observer who can ask the question, Who am I now? Once you can’t think of any more pieces to dismiss from your identity, ask yourself, How is who I am different from who anyone else is? Underneath all of the layers that separate us, you will find that which connects us all. Qui es-tu pour penser que tu peux changer le monde? Qui es-tu pour penser que tu peux changer? Who are you to think you can change the world? Who are you to think you can change? Who are you to think? Who are you to think you can change the world? …and who simultaneously takes part in the world, contains the world, and is the world. That’s who you are to think you can change the world.